In order to defend their interests against the forces of democracy, the corporations that now dominate much of the domestic and global economies recognize the need to manipulate the public through media propaganda by manufacturing their consent. This is largely achieved through coordinated mass campaigns that combine sophisticated public relations techniques. This is the context in which the UK political and media establishment continue to attack Labour leader, Jeremy Corbyn. The establishment are well aware that Corbyn can’t be bought off on their terms. The Labour leader’s sincerity, integrity and incorruptibility, represents a potential threat to these privileges and the gravy train that sustains them. It’s the possibility that Corbyn will break the iron-clad neoliberal consensus that underscores what has arguably been some of the most vitriolic and biased reportage ever witnessed against any British political figure. The level of the media attacks against Corbyn continued after he secured ‘the largest mandate ever won by a party leader’. The focus of these attacks included what colour poppy he would wear, his refusal to sing the national anthem or whether he would wear a tie or do up his top button. All of this was granted national news headlines and incessant coverage. Not to be outdone, in October 2015, the BBCs political editor Laura Kuenssberg featured in an almost comically biased, at times openly scornful, attack on Corbyn’s reasonable stance on nuclear weapons. 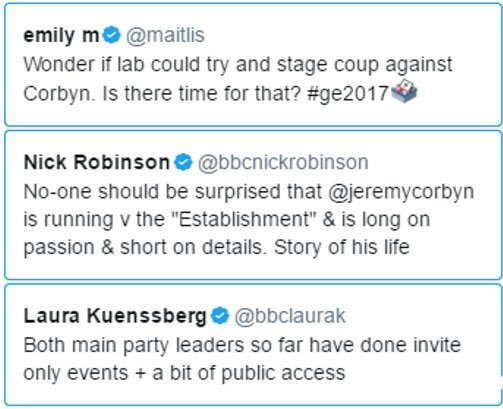 The BBC then broadcast five senior New Labour figures all opposing Corbyn without any opportunity for an alternative viewpoint. Kuenssberg followed up this hatchet-job three months later when she helped to orchestrate the live resignation of Labour shadow foreign minister Stephen Doughty on the BBC2 Daily Politics show as a pre-requisite to accusing Corbyn’s team of ‘unpleasant operations’ and ‘lies’. Then came the April 12, 2016 Telegraph article – a non-story about Corbyn’s state-funded salary and pension. Not to be outdone, eleven months later (March 5, 2017), the same rag continued with the smears by suggesting Corbyn had paid insufficient tax on his declared annual earnings – a claim subsequently debunked within hours on social media. Meanwhile, the news that Tory Chancellor, Philip Hammond, refused point-blank to publish his own tax returns after being prompted to do so by Shadow Chancellor, John McDonnell, did not receive anything like the same kind of media scrutiny. The implication was that Corbyn had misled the public. However, similar media outrage was not leveled at PM Theresa May after it was revealed (March 7, 2017) that she had lied to parliament after having falsely claimed that Surrey Council had not engaged in a ‘sweat heart’ deal with the Conservative government. A major content analysis from Cardiff University revealed that the BBC is pro-business and Conservative-leaning in its coverage. The London School of Economics and Political Science found strong media bias against Corbyn, claiming the press had turned into an “attack dog” against the opposition leader. The UK’s public service broadcaster gave double the airtime to Corbyn’s critics than to his allies at the start of the 2016 Labour coup, according to content analysis from the Media Reform Coalition. The evidence of bias outlined by the academic research and the concentration of power above, is proof-positive that the media propaganda against Corbyn is systematic and entrenched. Nevertheless, this is having no negative impact on the Labour leaders popularity among members and supporters. On the contrary, it seems to be having the reverse affect. The Labour party gained 60,000 members in one week following the attempted coup against Corbyn. Membership is currently higher than it’s previous peak of 405,000 last seen under Tony Blair’s leadership. In his constituency of Islington North, Corbyn inherited a majority of 4,456, which is now 21,194. He’s one of the few Labour MPs whose vote increased between 2005 and 2010, when he added 5,685 to his majority. Furthermore, London, Bristol and Greater Manchester now have Labour mayors, rolling back years of Tory dominance, while Labour’s majorities in by-elections have generally increased. It must also be remembered that pre-coup, Labour led the Tories in three polls in a row over 41 days. The long-term decline in Labour’s fortunes that preceded Corbyn can hardly be blamed on the Labour leader. Nevertheless, that hasn’t prevented many opportunistic and self-serving careerists within the party from doing so. Corbyn’s alleged weakness at the dispatch box is presented as evidence of ‘ineffectual opposition’ despite the fact that under his leadership the Tories have been forced into some thirty policy u-turns. In terms of some of the core domestic policy issues, Corbyn has the support of the majority of the British public. Following Theresa May’s surprise decision to call a snap election for June 8, 2017, the media bias against Corbyn appears to have been stepped up yet another notch, particularly by, but not limited to, the gutter Murdoch press. “Just putting those words in her piece – ‘scramble’, ‘cover up’, ‘unpopular’ – immediately inserts those words in the reader’s mind along with ‘Corbyn’; it encourages the reader to associate those words with the Labour leader. Consciously or not (likely the latter), she is deploying a well-known propaganda technique. In response to the Media Lens quote above, reader Matthew Alford, remarked on an “equally grotesque” example of BBC bias he witnessed on the BBC 10 O’clock News the previous evening: “This certainly did not look like a manifesto that had been scribbled on the back of a fag packet”. So why not just say “This was a professionally presented manifesto? Is it remotely conceivable that they would have said: ‘Theresa May’s manifesto was definitely not done on the back of a beer mat’?”, exclaimed Alford. This kind of sustained bias against Corbyn is, as to be expected, the result of an increasingly concentrated foreign ownership of the UK media who favour the Tories at the General Election, not least because of May’s hard Brexit strategy. This the mass media frequently depict as being indicative of the PMs ‘strength and stable’ leadership. Conversely, their antagonistic tone and depiction of Corbyn as weak and calamitous, is the opposite of the truth. “Mainstream media as a whole took its gloves off and Corbyn’s electoral hopes have been doomed from day one. He was “a great leap backwards”, said the Mail. Beware this “absurd Marxist”, said the Express, while the Daily Telegraph referred to his “divisive ideology” and “atavistic hostility to wealth and success”. And the Sun? It just called him “bonkers”. There was scepticism too from the liberal left. The Independent thought he would not persuade middle England to accept his policies. The election campaign strategies of the two leaders couldn’t be more different. While May’s robotic and lacklustre performance overseen by Lynton Crosby’s single issue Brexit strategy is being engineered to avoid public and media scrutiny, Jeremy Corbyn’s campaign has been marked by a willingness to engage with the public. While Corbyn has been open, transparent and accountable, May has been robotic, secretive and aloof. While May comes across as cold, calculating and lacking in human empathy, Corbyn comes across as being totally at ease with the public, smiling and relaxed in their company. Corbyn has openly espoused his philosophy and numerous policy initiatives, many of them significant. May, by contrast, appears to have no policies to discuss and comes across as somebody who is instinctively autocratic and awkward. Whereas Corbyn’s campaigning has been marked by spontaneity and his willingness to reply to previously unseen questions in public meetings and press conferences, May’s series of stage-managed PR stunts are exemplified by an eagerness to rely on focus groups and a carefully selected media who provide her with questions pre-vetted and selected in advance by the Tory Party. Whatever is being taught on journalism courses these days, the work of Chomsky and Herman is clearly not on the syllabus. My advice to Garnier is to spend 30 minutes watching the formers demolition of Andrew Marr before taking on her next journalistic assignment. That Garnier, as a BBC journalist, fails to recognise that access is determined by the lack of difficult or challenging questions indicative of how the media works, is frankly staggering. What is equally staggering, is the fact that lack of access and the closing of journalistic ranks with the governments complicity, is not seen as an outrageous attack on civil liberties, democratic accountability and press freedom. It should be remembered that Theresa May was not elected as PM. She is silent about what her policies are, refuses to engage with the public and be open with journalists, and finally, is denying the opportunity of a face-to-face TV debate with the leader of Her Majesty’s official opposition. This is akin to a dictatorship. 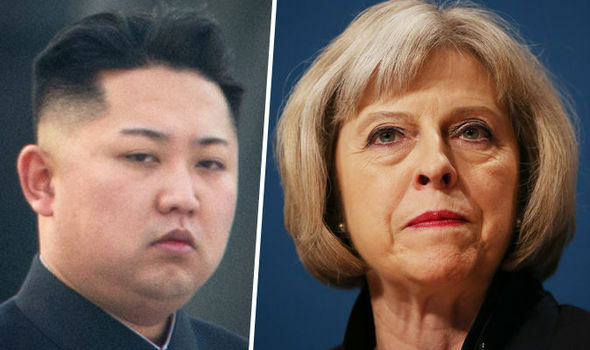 If the UK media were to report on a similar scenario in North Korea they would be describing the government their as authoritarian or similar. What is happening in Britain, under the guise of a free media, is that basic democratic norms are being trampled on by the government and there media accomplices, and hardly anybody in the British establishment is blinking an eyelid. I rely on the generosity of my readers. I don’t make any money from my work and I’m not funded. If you’ve enjoyed reading this or another posting, please consider making a donation, no matter how small. You can help continue my research and write independently..… Thanks! ….WOW!! !….SMASH, BANG WALLLOPPP!!! !…..well said that man!! !…please please please keep writing such ´easy to read´ but completely ´bang on the money´pieces…comparing, backing up facts, quoting high level sources and reputable folk….how can we get such clear and concise yet verifiable pieces into MSM outlets? ?…will it ever be possible? ?….I am certain that if it were possible the general public might just switch their brains on a wee bit more to see exactly who (politicans) and which party has their back and interests at heart…donation on the way buddy!! !…excellent stuff…next project get such stuff out to the masses beyond JC & Labour supporters…. Thanks Rob. I really appreciate your kind words and generosity. I only wish there were more people like you out there. Donations are extremely thin on the ground. If everyone who read my articles donated just £1 I would be OK. but things are extremely hard. I guess, the attitude of folks’ is well, “somebody else will donate, and I absolve all responsibility even though I read and appreciated the article”. I think many people, don’t fully appreciate just how much effort and time it takes to research and put an article like this together. I guess it’s the nature of “the something for nothing society” exemplified by the internet. That’s why creative industries are dying because very few people expect to pay for anything anymore – applies to music downloads etc. It’s not acceptable to expect to benefit for free off other people’s labour. in other industries it’s deemed unacceptable, so why this one? Anyway, sorry for whinging. Had to get it off my chest. Hi Daniel, thoroughly enjoyed this article. As a rule I don´t normally donate to political websites but, as a former sub-editor, I would be happy to proof your stories for free before publication. If you are interested let me know. A good analysis of the media “hate fest” against Corbyn and the left in favour of the Tory and May’s “weak and wobbly” party.